Completely childproofing your home can be difficult. Whether you have a baby, toddler, or school-age child, your home should be a place, where your little one can explore safely. After all, touching, holding, climbing, and exploring are the activities that develop your child’s body and mind. 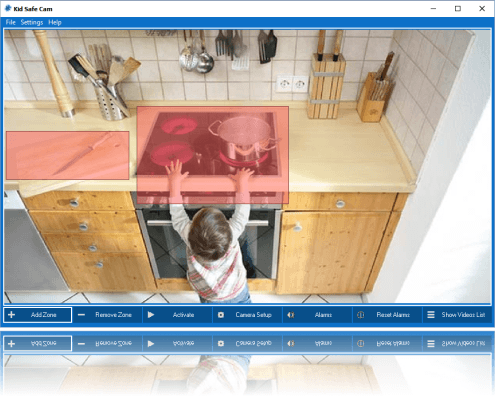 KIDSAFECAM IS A FREE SOFTWARE! 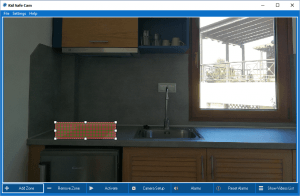 Self-Learning advanced motion detection mode uses advanced algorithm with Artificial Intelligence (AI) for detecting motion and presence in the danger zone. The mode is not color and light dependent and can be used in places with changing brightness. 1. After downloading and installing KidSafeCam on any Windows based PC with a web camera start the application. 2. Place your PC and Web Camera pointing to a danger zone in your home, which you want to monitor for motion. Danger zones could be the kitchen oven, knife holder, sink, stairs, doors, windows, etc.. Add one or more zones, which you want to monitor, by clicking the “Add Zone” button. 3. Move and resize the newly added zone to the danger zone, so it is all covered by the danger zone selector. 4. Start the monitoring process by pressing the “Activate” button. The danger zones must remain clear of motion for a few seconds at the beginning so the application can collect visual information about each danger zone, used later for the motion detection process. On motion in any of the zones an alarm will sound.